Sun Protection With A View! 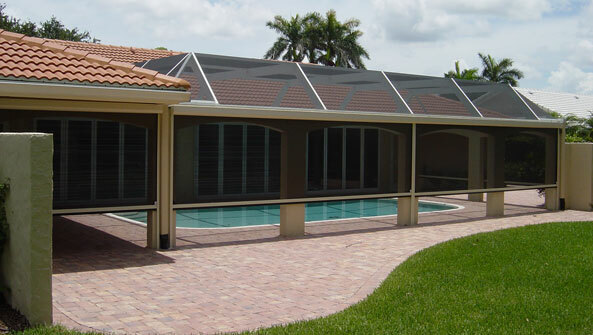 Our solar screens by Alutech combine the best features of a rolling shutter with the latest innovations in sun control. Choose between the Solar-Tex standard or Zip-Tech plus in a variety of colors and fabrics in measurements to fit your needs. ...with a shading product built to handle the sun's damaging rays and harsh exterior environment. The Zip Tex and Solar Tex exterior rolling solar screen is the ideal product to control the sun's heat, damaging rays and glare. It will protect your home furnishings from fading and will also reduce your air conditioning expense by as much as (60%) sixty percent. Our unique end retention option ensures wind resistance and operabilty using a buit-in dampening system. Zip Tex is equipped with a special side rail insert that allows the screen to flex under wind pessure, but keeps the screen anchored in the rails. The Zip Tex will keep you screens in the rails at any position, fully closed, fully open or any position in between.